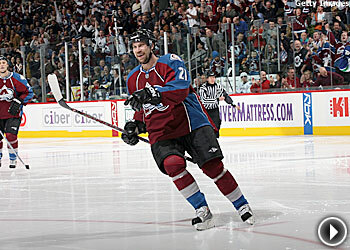 Peter The Almost-Great – After picking up three assists in the Colorado Avalanche's 6-3 win against the Vancouver Canucks on Wednesday night, Peter Forsberg is feeling pretty good about himself. But until he scores his first goal since signing with the Avs on March 4, Forsberg isn't about to pat himself on the back. "I don't know if I'm back yet," he said. "Those weren't the prettiest points, but I'll take them anyway." The most important thing, though, is Forsberg's health. The two-time Stanley Cup winner appeared in only his third game since March 8 due to a groin injury. Forsberg's entire line was outstanding Wednesday night. The trio of Forsberg, Paul Stastny and Milan Hejduk combined for nine points and helped chase Canucks goalie Roberto Luongo during the second period. "Any time you have a top-caliber player they've got to respect what he does,'' Stastny said. ''He can score, too. He hasn't scored yet, but he's a pass-first player these days. Hedgie's the natural goal scorer on that line, but we can chip in here and there. You have to watch all of us and it makes it easier to move around." Branko Radivojevic celebrates along the bench with teammates Mark Parrish and Brian Rolston after scoring a goal against the Edmonton Oilers. Sweet Revenge – The Minnesota Wild weren't about to come out Wednesday night against the Edmonton Oilers at Xcel Energy Center the way they did 48 hours earlier at Rexall Place. After allowing three goals in the first five minutes in a 5-3 loss Monday, the Wild came up with a big performance – led by goalie Niklas Backstrom, who made 32 saves – and regained control of the Northwest Division with a 3-1 win against the Oilers. "I know a lot was made of that game in Edmonton,'' said Wild forward Brian Rolston, who scored a shorthanded goal in the victory. ''We were on our heels. We didn't look good. We didn't have the energy. That was the bottom line. Those kinds of games happen. It was good that we put that one behind us and came out with a big effort tonight." The Oilers, meanwhile, might not be able to put this one behind them. In the end, it could very well be the loss that ruined their playoff hopes. Edmonton, which is three points behind No. 8 Vancouver, plays three of its four remaining games on the road. The Oilers are 16-18-4 away from Rexall Place this season and still have to contend with Nashville, which is a point ahead of them in ninth place. Making A Statement – After having the doors of Nationwide Arena blown off twice in a row by the Chicago Blackhawks, the Columbus Blue Jackets weren't about to be embarrassed in their barn again. Fredrik Norrena stopped all 17 shots he faced, while rookie defenseman Clay Wilson had a goal and an assist as Columbus blanked Chicago by a 4-0 score Wednesday. The Blackhawks had outscored the Blue Jackets 13-5 in the last two meetings in Columbus. "They crushed us the last couple of games at home," Norrena said. "We underestimated them for some reason. It's the two toughest games I've had all year. Tonight we slowed them down." Wednesday's performance also showed what the Blue Jackets are capable of when they put forth a 60-minute effort. But such displays have been few and far between in recent months for Ken Hitchcock's club, which pulled within a point of No. 12 Chicago with the victory. "We've been up and down for a while, playing a good period here and a bad period there," Columbus captain Rick Nash said. "Finally, tonight we put three periods together, and it shows what we can do when we play our style." While the Blackhawks haven't been mathematically eliminated from the postseason yet, Wednesday's performance all but cleared their schedules for the summer. The lack of intensity clearly bothered Chicago coach Denis Savard. "We didn't have too many shots, too many good scoring chances for whatever reason," Savard said. "To get as few a shots as we did is frustrating. It's tough to take now. It was a big game." Home, Sweet Home – Another game at the Honda Center, another win for the Anaheim Ducks. Ducks goalie Jonas Hiller stops a shot by Kings right wing Brian Willsie to give the Ducks a 2-1 win in a shootout. The defending champs made it 10 straight on home ice with Wednesday night's 2-1 shootout win against the pesky Los Angeles Kings. The Ducks also tied their franchise record with their 26th home win, matching the mark set each of the past two seasons. Most importantly, the victory officially gives the Ducks an opportunity to defend their title as they clinched a spot in the Stanley Cup Playoffs. "It's great that we're in the playoffs," said Ducks goalie Jonas Hiller, who was sensational in a 31-save effort. "It was a tough game. During the game, you probably don't think about it too much. You just try to do your job. I think everybody did pretty well on our team tonight." While the Pacific Division has been all but decided – San Jose has a four-point lead on the Ducks – Anaheim did create some distance between the fourth and fifth seeds in the Western Conference. The Ducks moved four points ahead of No. 5 Calgary with Wednesday's win. Anaheim hosts the first-place Sharks on Friday night. "It was nice to clinch a spot tonight and it's nice to be at home," said Ducks defenseman Mathieu Schneider, who scored the game-winner in the shootout. "The comfort of knowing that we're home basically for the rest of the season going into the playoffs I think gives us a little bit of peace of mind and a chance to really get our bodies ready."